Preacher's Right Arm is a Weapon in Dark Souls 3. It is part of The Ringed City DLC. The dessicated right hand of a white-faced locust that rose from the abyssal swamp, that happens to perform as a catalyst for sorcery. The white-faced locusts were meant to beckon men to the dark with sermons, but most of them are unable to think past their own stomachs, the unruly mob! Use souls to weave a sharp branch to fillet prey. Can be used repeatedly. Has 229 spellbuff at 60 Intelligence. Has slightly lower spellbuff than the Court Sorcerer's Staff and lacks Steady Chant. This makes it a bad choice for mages whose playstyle depends on these two things. It is more suited for battle mages however due to its Weapon Art. Works well with Farron Flashsword for expanding its melee movesets. The Ringed City: From the Ringed City Streets bonfire head into the swamp and head straight. Head past a few Locust men and head to the right of the huge Judicator enemy in the middle. There will be a corpse hanging from a structure here. Be careful as it is surrounded by hidden Locust Men. Preacher&apos;s Right Arm: 50 Int - 205 Spellbuff Court Sorcerer Staff: 50 Int - 202 Spellbuff Hmmm. Pretty sure the WA scales with strength, can somebody confirm this? Those locust guys are annoying, and have*****loads of health at NG +5. Five or six hits with a weapon at 1100 AR required to kill them. Annoying glue farting attacks. The aforementioned grab attack. *****ty branch stabbing rush attacks. ***** &apos;em. Even more annoying than the spinning miracle turtles. Ringed City is a great location for torturing yourself, true Dark Souls experience. Every enemy will ***** your***** up and mercilessly punish the slightest mistake. I dunno why I love this weapon so much, but I guess I always felt like an Arm-y man. Gotta hand it to FromSoft, this is one of the oddest items throughout ALL of their games and also comes with a stick! 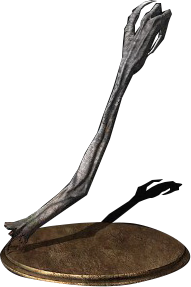 Let me again enlight you peasants: Bloodborne, Arm of Amygdala. It would be amazing if you could grab players with these and bite them if you equip them in both arms. Is there any reason for this to not drop from locusts? Why wouldn&apos;t we rip their arms off. What is stopping us? I see someone running around the Abyss Swamp yelling "Quit hitting yourself!!" slapping all the locusts. So does Andre just smash titanite ontop of the arm or shove it up the open end? I have discovered that with enough stamina and intelligence you can one shot any player. After this weapon, DS3 PvP was destroyed, or what was left of it anyways. This thing is actually pretty handy. Use this weapon, and exercise your right to bear arms. If you use it, you&apos;re armed pretty well, but be sure to keep your enemies at arm&apos;s length with it. You should use heavy arm-or with it as well. Kinda wish there&apos;s a Preacher&apos;s Left Hand, or better yet, imagine Preacher&apos;s Paired Staves. what if this was just both arms and they were int scaling paired hammers that couldn&apos;t cast spells but still do the weapon art? Have you met my friend, Jill?